Mouse anti Human salivary amylase antibody recognizes human Alpha-amylase 1, also known as salivary amylase, 1,4-alpha-D-glucan glucanohydrolase 1 or Salivary alpha-amylase. Salivary amylase is a 496 amino acid ~58 kDa secreted protein and member of the glycosyl hydrolase 13 family. 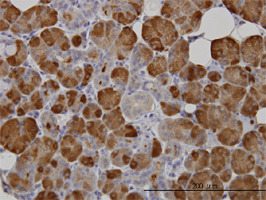 Recombinant protein corresponding to aa 172 - 246 of human AMY1A.